Adam Johnson has told his Sunderland team-mates to take advantage of the absence of so many key Newcastle United players at an “angry” St James’ Park tomorrow. As well as being without injured captain Fabricio Coloccini, suspended top-scorer Loic Remy and second highest-scorer Yohan Cabaye, who joined Paris Saint-Germain on Wednesday, the man third in the Magpies’ goalscoring chart – six-goal Yoan Gouffran – is doubtful with an ankle injury. The remainder of Newcastle’s squad combined have only one more Premier League goal than Johnson’s six for Sunderland. “We have watched their games and we have to try and take advantage of anything that has happened to them,” said the Easington-born winger, who will be one of the few North East natives on the field tomorrow. “If there is any way we can get a 1% or 2% advantage that must be good for us. “We will go into the game knowing it is a big blow for Newcastle to lose not just their best player, but their two best players (in Remy and Cabaye). The goals Remy has scored speak for themselves, but it is still a very tough place to go and we have just got to go for it. Johnson was part of the Sunderland side which did that in April, scoring in a 3-0 win which was the first of two in a row against Newcastle. The Magpies have not won any of their last four derbies, and Johnson expects that to be a factor. There are bound to be more than a few angry supporters on the terraces too. “It is part of the game isn’t it?” said Johnson. “That’s what you play for. It’s great for the fans and the passion is intense, so I wouldn’t have it any other way. Johnson’s stunning goal underlined rank outsiders Sunderland’s dominance in April’s meeting. “It was in the biggest game of the season, the derby, and those are the type of things that you play for, to score like that in derbies,” Johnson reflected. “It was a great personal moment for me. “Just the win made it so special. If we can build on what we have done in the last couple of weeks and get a result there we will be happy and we are definitely going there to win. We have been very good away from home and have played very well. Despite Newcastle’s loftier league position, relegation-threatened Sunderland will be tomorrow’s form team, and Johnson the form player. 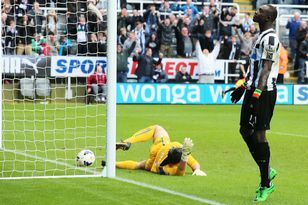 The Wearsiders have lost two of their last 13 games – and one of them ended in a penalty shoot-out win – while Johnson has scored six goals in as many matches. “We are through to a final, the next round of the FA Cup and we won again in the league on Wednesday (beating Stoke City) so everything is going great for us right now,” he said.